Detroit Country Day School (DCDS), a non-denominational college preparatory school, recently announced that Elana Sullivan has been named chief advancement officer. As the chief advancement officer, Sullivan will oversee fundraising, alumni relations, marketing, and communications. Previously, she served as Michigan’s chapter president of the National Multiple Sclerosis Society and corporate senior director of foundation and community development at Henry Ford Health System. Sullivan was also a featured TED talk speaker for the opening session of the 2016 points of light global conference on volunteering and service and is an inaugural graduate of the Henry Ford Health System leadership academy. 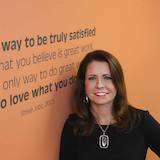 Under her leadership, the Michigan chapter of the Multiple Sclerosis Society was an eight-time winner of the Alfred P. Sloan award for business excellence and workplace flexibility, a three-time winner of metro Detroit’s best and brightest places to work, the 2014 Crain’s #1 Coolest Place to Work in Michigan winner, and the 2015 Best of Michigan’s Business Non-Profit Beacon Award recipient.